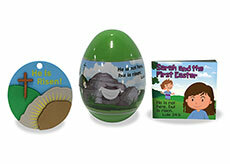 Jumbo size, 3 inch Gospel Easter Egg has a colorful shrink wrap and comes with a build-your-own Resurrection scene foam kit and mini book. The egg features the theme Bible verse Luke 24:6 (KJV), He is not here, but is risen on the shrink-wrap overlay. 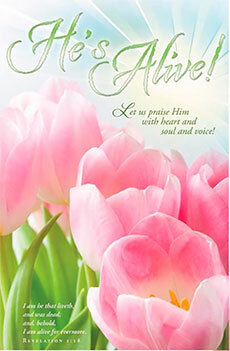 The 16-page mini book tells the story of the first Easter through the eyes of Sarah, a young girl. The language and illustrations will engage children while the miraculous story of the first Easter is told. Recommended for ages 3+. Handout one per child at the end of community Easter egg hunts, give away at Sunday school or other children's ministry events. Size: egg is 3 in. tall, mini book is 2½ x 2½ in., foam activity: 4 pieces 2 ½” x 2 ¾” includes 10” ribbon.